Rather like a small cichlid in shape, this fish is greenish grey in colour with a series of narrow, somwhat patchy, vertical bands along the flanks. Extremely timid and peaceful, this fish can only be recommended for use in community tanks contaning very quiet fish such as neon tetras. The aquarium must be thickly planted and the aquarist must ensure each fish has a cave of its own. Feeding can be tricky; small live foods are preferred but frozen bloodworms and other similar foods will also be taken. Dried food such as flake is ignored. These fish are territorial and hold small patches around caves or the roots of large plants. Males are more brightly coloured than the females and have a convex ventral surface. The females have a more rounded belly and a slightly concave ventral surface. 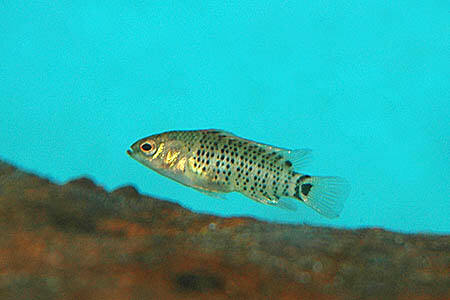 Breeding is similar to that of a dwarf cichlid, with the male guarding the eggs. He will further protect the fry until they have consumed their yolk sacs, but once the fry are free swimming, he ignores them. Raise the fry on tiny live foods.